Tommy Barker, who has died age 91, picks up another trophy during his scrambling heyday. Always slight in build, Tommy Barker, who has died age 91, was frail in the final decade of his riding years and a lack of strength in his legs closed down his riding career at the age of 89. But, in his younger day he’d been a formidable Western Centre scrambles champion, first on a Gold Star when he came out of the Army in 1948, then on two specials he built. The second was a Velocette 250cc MOV engine with Venom cams built into own frame. On this he fought off the two-strokes for 10 years, with over 100 wins. But after nearly a decade of running at the front the Velo was pensioned off and in 1962, at the age of 36, Tom stopped racing. 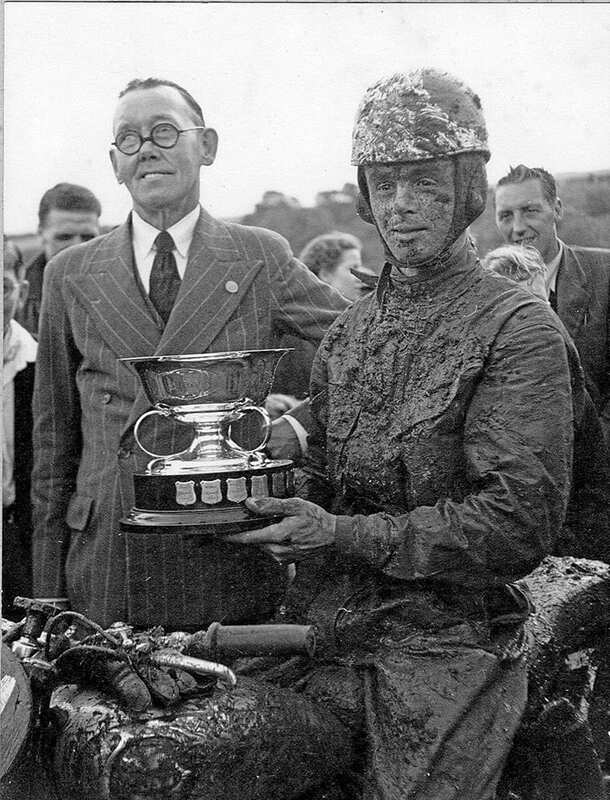 He then built a beautiful 250cc Velocette trials bike on which he continued to compete in Western and Wessex Centre events for the next 20 years. It was with all this experience, skill and undoubted ability as an engineer that Tommy came to the restoration scene in the mid-1980s. He bought the rusty carcase of what was to become, after a further three years of collection and refurbishment, a superb BSA B21. The bike is still in the Stroud area and remains a living testament to the skill and artistry of this fine motorcycle engineer.